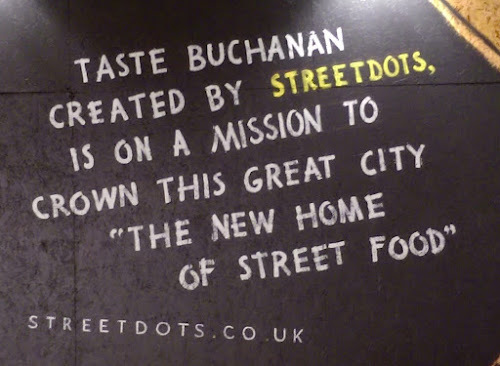 Forget the tired old food court, Taste Buchanan launches this week, transforming the top of the Buchanan Galleries in to a colourful pop-up food hub with an ever-changing line up of Scotland’s best food producers ready to serve the hungry Glasgow public seven days a week. Taste Buchanan is now open to the public with a mouth-watering array of traders serving up the likes of gourmet hot dogs, lip-smacking waffles, sour dough pizzas and Asian bao buns all washed down with a Scottish craft beer and cocktail bar. Taste Buchanan is an innovative partnership between Land Securities-owned Buchanan Galleries and hi-tech street trading platform StreetDots, who are behind similar ventures in London. Inverness-born Atholl Milton, founder of StreetDots, said: “The timing is right for bringing this to Glasgow. 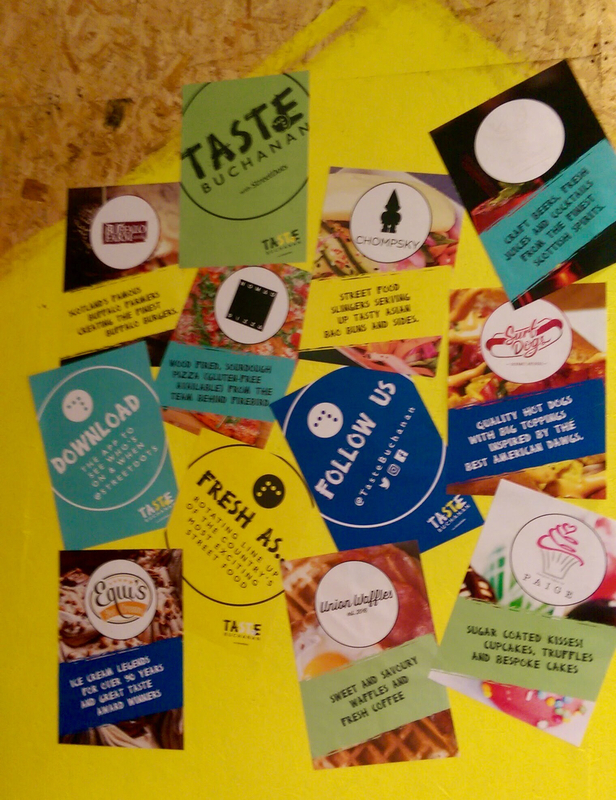 There’s such an appetite in the city for interesting food, with great ingredients at a decent price. We’ve got some of Scotland’s most exciting traders coming together to offer up something a bit different and there’s always going to be something new for people to try. The Buffalo Farm, a family business from Fife, originally began as a small business producing meat to sell primarily at farmer’s markets. But since those humble beginnings, the business now run three butcher shops, a busy event catering business as well as supplying an ever-growing portfolio of restaurants and hotels. Passionate about producing the highest quality meats, poultry and game, Buffalo Farm will be serving up a host of dishes including their specialty water buffalo burgers – a favourite with celebrity chef Gordon Ramsay! 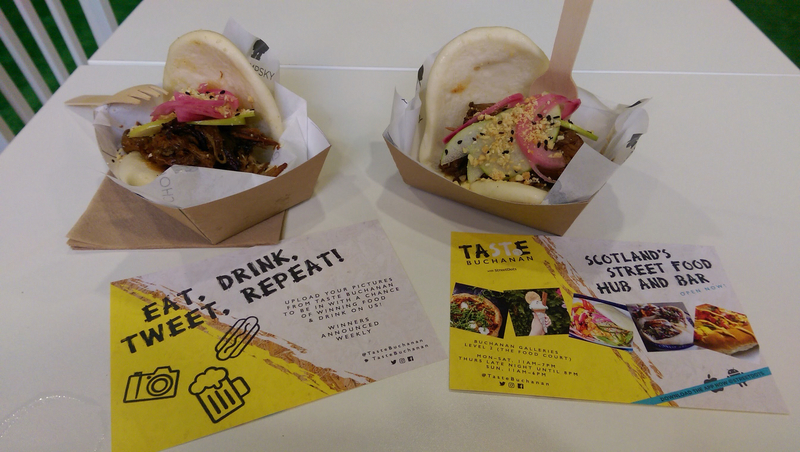 Glasgow based street food company Chompsky will be serving up fresh, steamed bao buns at Taste Buchanan. 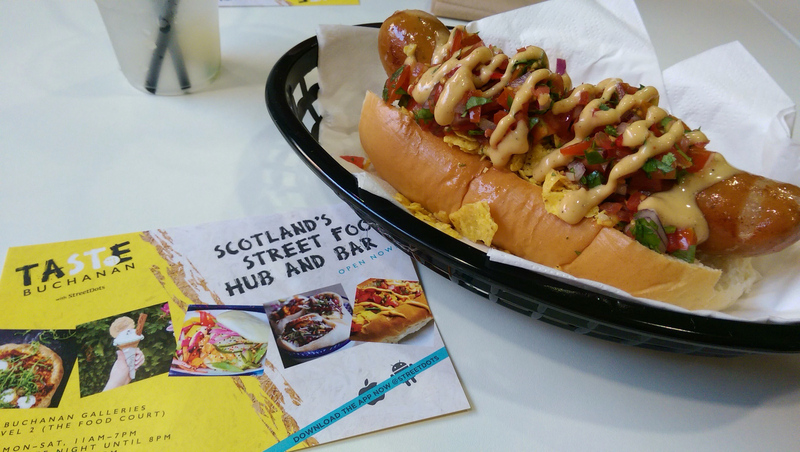 Already a favourite in the Glasgow street food scene, Chompsky will be showcasing their signature style which is packed with Asian fusion flavours, and they will have everything from hoisin pulled pork and teriyaki prawns to Korean fried glazed chicken on offer. Designer Cakes by Paige is a Glasgow based family run business, committed to providing their customers with spectacular cakes for any special occasion. 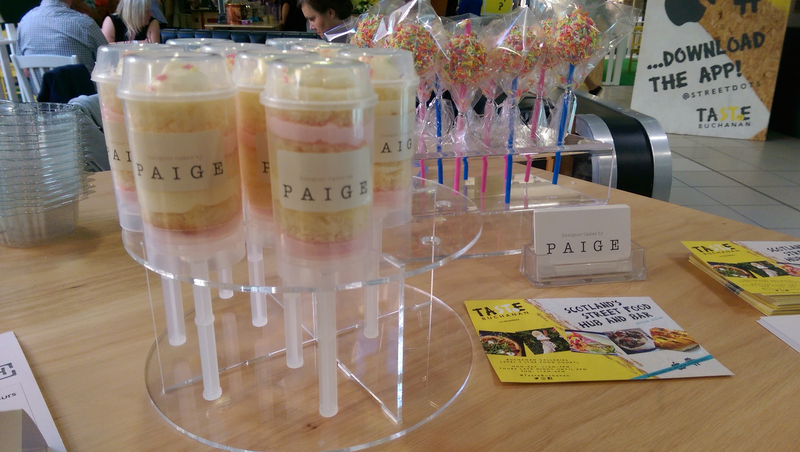 Armed with a whole host of sweet treats at Taste Buchanan, Designer Cakes by Paige will have handmade cupcakes, cake pops and decadent truffles for everyone to enjoy. 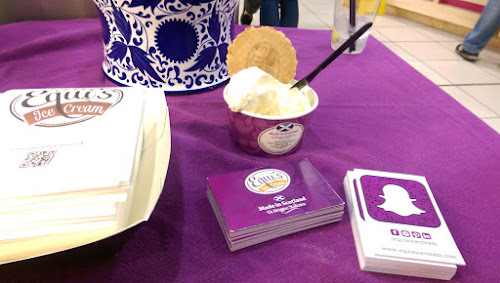 Equi’s will also be on hand to provide sweet treats, and have been serving up the finest ice cream for more than 90 years. A family run business which still use recipes which have been passed down through four generations, Equi’s will bring the public’s favourite flavours and indulgent ice cream delights to Taste Buchanan. Nomad Pizza will be delivering a variety of handmade, authentic pizzas. Their signature sourdough pizzas cook in ninety seconds and are topped with the finest Italian inspired ingredients. 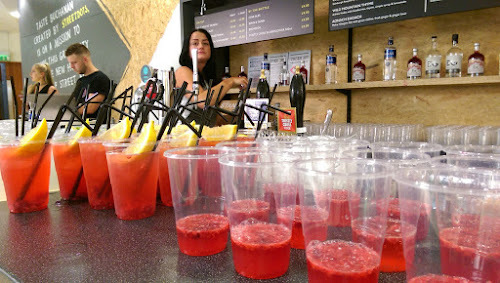 Slàinte Mhath are providing the bar at Taste Buchanan and will be serving up a host of craft beers, spirits and cocktails. A Scottish themed venue from the team at Perfect Parties Slàinte Mhath will be pouring the finest craft drinks, all with a Scottish twist. Owner of Surf Dogs, Martin Capaldi, began his career as a sound engineer for a host of talented artists. Having travelled around the world, journeying everywhere from Glastonbury to Ecuador, Martin decided it was time to hang up his headphones and embarked on a new culinary adventure. Inspired by his time touring the United States, Surf Dogs are passionate about creating the most adventurous and delicious hot dogs on the market, and will be serving them up with authentic American sides. Union Waffles was born through founder’s Daniel and Sy’s love of fried chicken and hot sauce on an American waffle. The unusual flavour combination inspired them to push the boundaries even further and experiment with a vast range of sweet and savoury options. They will also be serving up fresh coffees and refreshments. Taste Buchanan will open to the public on Friday August 19, trading seven days a week from 11am to 7pm most days 8pm on a Thursday and 6pm on a Sunday. I am surprised about the number of hotel booking sites and 1 celebrity rating you come up with for rate evaluate.com. I have used the website upon numerous events and never had any kind of issues with any part of the booking or even termination procedures. Within reading some of the negative remarks I am would endeavor to say that the issue is not with.